U-M Department of Computational Medicine and Bioinformatics website. The National Center for Integrative Biomedical Informatics (NCIBI) is one of eight National Centers for Biomedical Computing (NCBC) within the NIH Roadmap. The NCBC program is focused on building a universal computing infrastructure designed to speed progress in biomedical research. 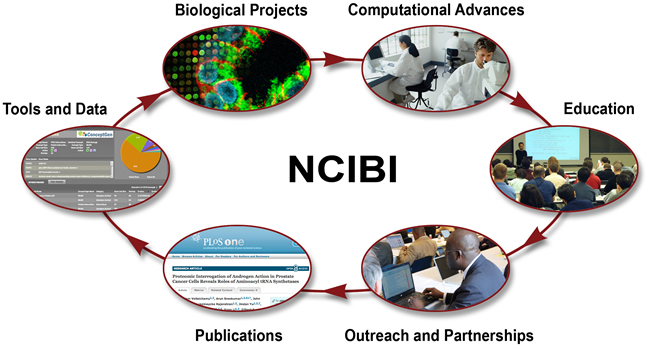 NCIBI was founded in September 2005 and is based at the University of Michigan as part of the Department of Computational Medicine and Bioinformatics (DCMB). Integrates vast amounts of diverse, multi-scale data and derived knowledge, including context-appropriate molecular biology information from emerging experimental data; gene, protein, and metabolite databases; and the published literature. Collaborates to determine how these data sets can best be represented and developed into resources that will advance research and facilitate biomedical discoveries. Creates relevant tools for analytically exploring the data to uncover and validate functional associations and possible causal and conditional relationships involved in mechanisms of complex physiological processes or diseases. Develops an array of tutorials, seminars, documentation, and other training materials to assure both the usability and usefulness of NCIBI tools. Disseminates discoveries and processes to biomedical communities worldwide through publications, presentations, national partnerships and collaborators, and e-networking initiatives such as an RSS feed and the NCIBI gateway. The tranSMART Foundation Wins Awards at the BioIT World 2015 Conference! NCIBI researchers among international team that identifies genetic variants that contribute to mental illness. Dr. Gilbert S. Omenn discusses the emerging HUPO Human Proteome Project on Australian SkyNews. We are pleased to announce the official release of our new web-based tool, LRpath. This tool performs gene set enrichment testing, an approach used to identify key pathways and other biological concepts affected in high-throughput experiments. LRpath uses all analyzed genes and their significance levels to assess enrichment, and thus does not require a significance cut-off. It is powerful for experiments with either small or large sample size, and offers the ability to cluster and compare enrichment results from multiple experiments. We are pleased to announce a release of Metscape 2.2. The most prominent changes include a more versatile workflow and enhanced visualization features. Gene2MeSH and Metab2MeSH versions 3.0 have been released. Announcing the MiMI 3.1 release. This update adds compatibility with Cytoscape versions 2.8 and 2.8.1, fixes links to external web services, and incorporates the ability to search for Genes by MeSH terms.